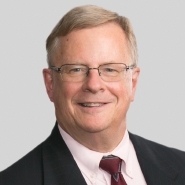 Porter Wright partner Dixon Miller has been appointed chair of the International Law Certification Committee by The Florida Bar in Tallahassee, Fla. Miller will serve as chair from July 1, 2014, through June 30, 2015. Before he begins his term, Miller will attend the Committee Leadership Conference during the Bar's Annual Convention. "We appreciate your dedication to committee service and our profession, and know that your leadership skills will greatly contribute to the success of the committee's goals."